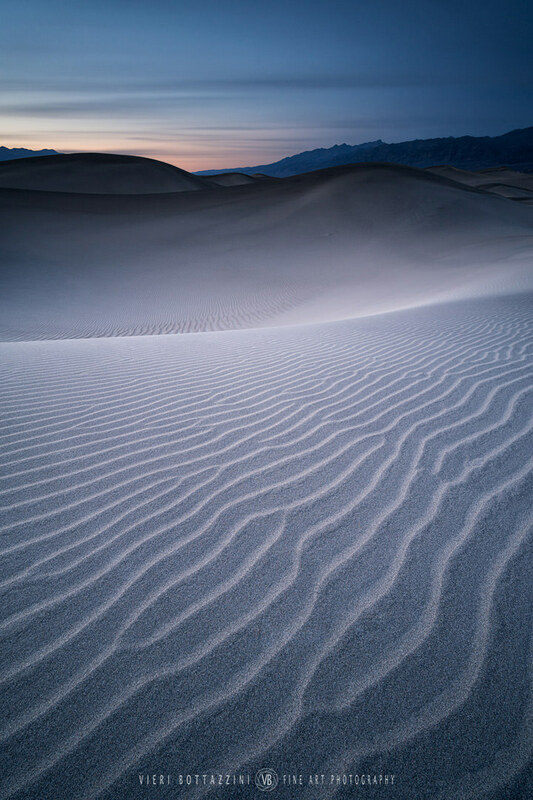 Beautiful Mesquite Dunes, in Death Valley (USA), are always a great source of inspiration for me and lend themselves to long exposure abstract images perfectly. Thought of snow at very first look. Amazing picture. It's gorgeous, Vieri, but what does the long exposure give you? Beautiful composition, colors and tones. Perhaps some cropping of the near foreground dunes may focus the attention on the image. Gives you a natural smoothing filter over the sky…and over the dunes as well if there's wind. Thank you very much Rajan! Thank you Ken! Yes, I agree with you that colours helped here, I gave it a try in B&W just to see how it looked and it didn't work for me at all. Terrific! The touch of warm colour in the distance takes the eye through the image excellently, and the foreground details are very enjoyable. I understand. To be honest, we get cloud formations that look very similar to that so often over here that it hadn't occurred to me that they were produced by a long exposure. But then, we get cloud formations of all kinds over here, with depressing frequency. on your remark about getting cloud formations of all kinds... and sorry that they appear with depressing frequency! Where are you based? Manchester, Vieri (tthe original one, in England, not the new, flashy fake that Hollywood likes so much). I'm looking out of my window at clouds very similar to the ones in your photo. It rains a lot here. As the late Humphrey Littleton said, introducing the place on a radio programme, "Mancunians say that what Manchester has today, the rest of the world will have tomorrow. So if you're listening, rest of the world, it's drizzle". Thank you very much Jeremy, now I see what you mean! Well, in Death Valley drizzle is somewhat rarer thank i Manchester, thankfully... perhaps Humphrey Littleton's forecast didn't reach that far!